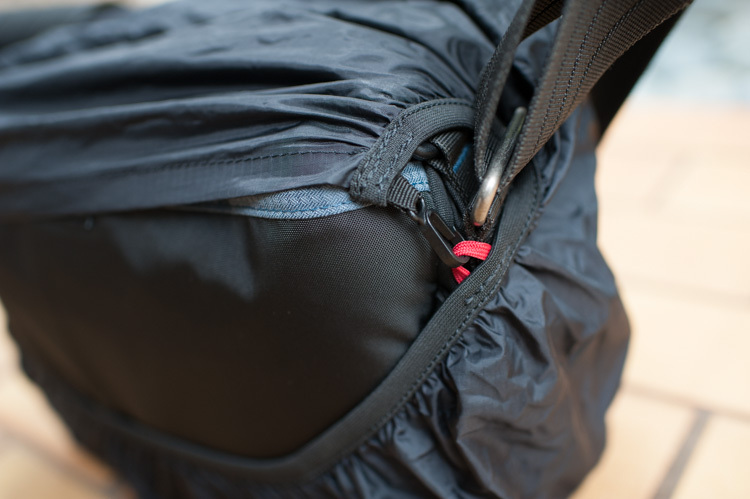 Think Tank City Walker 20 Review | Observe. Compose. Capture. There are three sizes in the City Walker series...10, 20, and 30. I chose the middle size, the 20. The interior consists of a removable foam insert with adjustable velcro pieces. 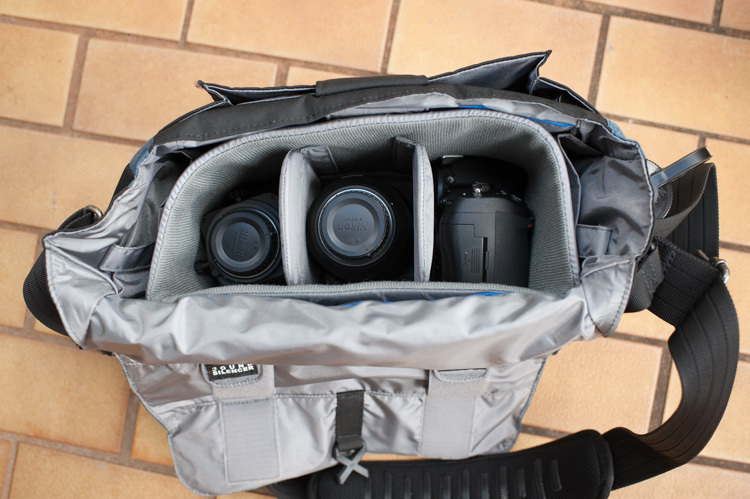 This was a big selling point for me, because it means I could take out the whole insert if I wanted to use the bag for a non-photography outing. Another great thing about this bag is that the bag's sides are not rigid and conforms nicely to the side of your body when carrying it. 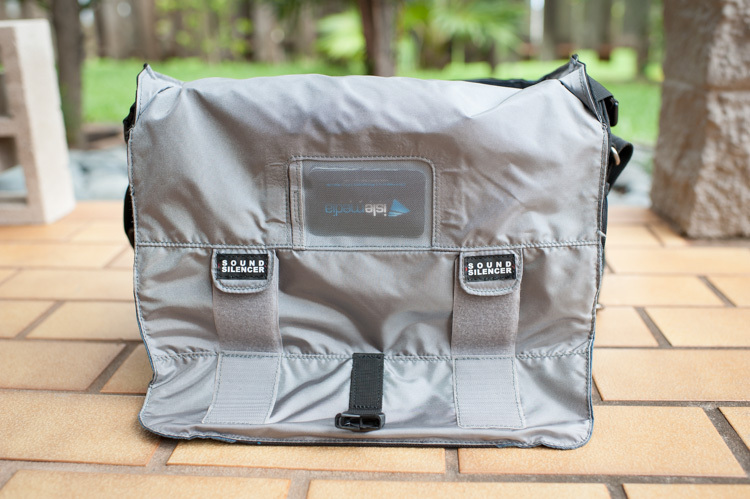 This organizer is handy for holding things like small flashlights, memory cards, lens cleaners, or energy bars. 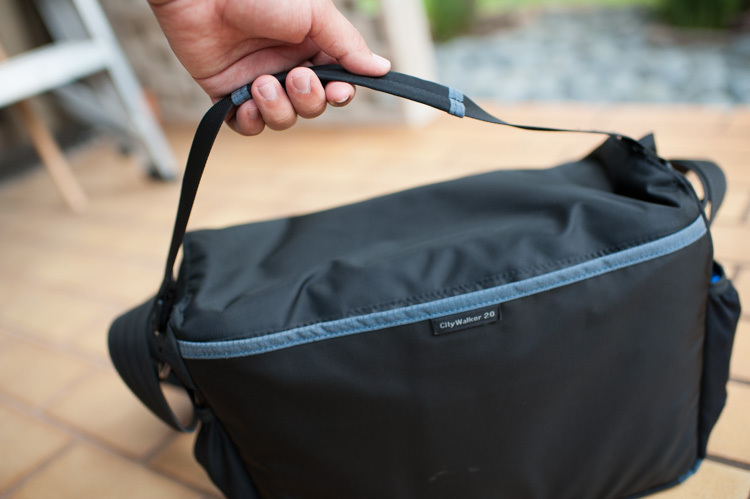 There are also plenty of zippered pockets and compartments in this bag. 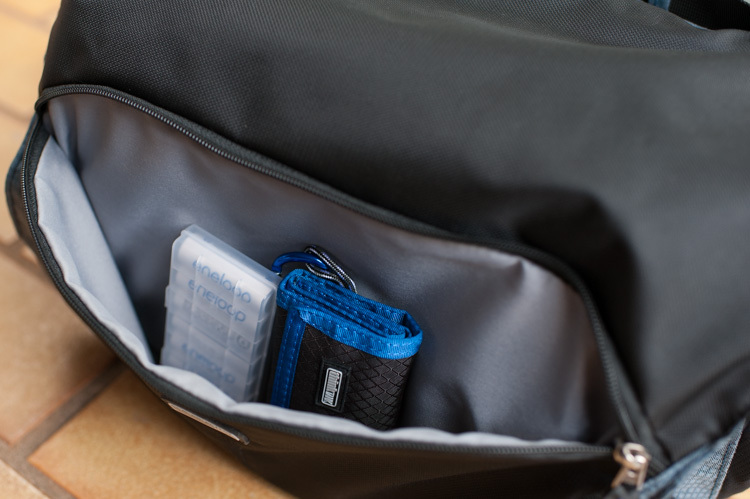 The zippered pocket shown above can fit items like my AA Eneloop batteries, or Think Tank Pixel Pocket Rocket. External: All fabric treated with for durable water-resistance, plus fabric underside has a polyurethane coating for superior water-resistance, YKK® RC Fuse (abrasion-resistant) zippers, 420D velocity nylon, 420D high-density nylon, 600D brushed polyester, 250D shadow rip-stop polyester, Derrington™ mesh pockets, antique nickel-plated metal hardware, Dual Cross™ Buckle, 3D air mesh, mono mesh, 3-ply bonded nylon thread. Internal: Removable PE board reinforced closed cell foam dividers, 210D silver-toned nylon, polyurethane backed velex liner, 2x polyurethane coated nylon 210T seam-sealed taffeta rain cover, 3-ply bonded nylon thread. 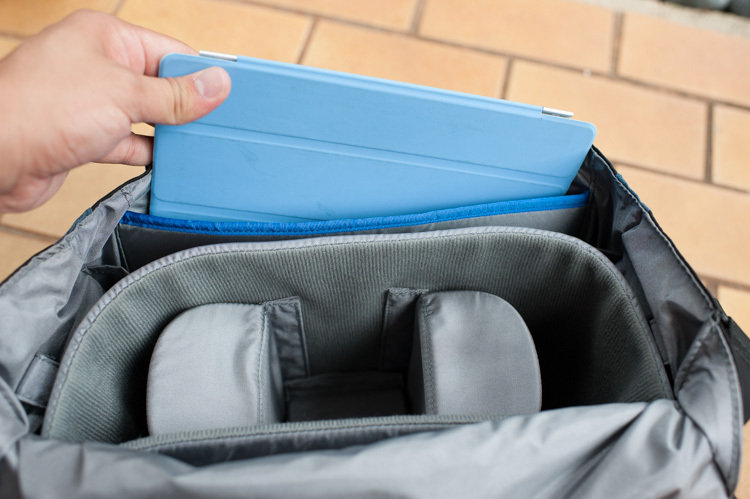 There is a dedicated padded tablet sleeve that fits my ipad 2 perfectly, although the larger cases (i.e InCase or Otterbox) for the ipad won't fit in this sleeve. On both sides of the main insert, there is a pocket that will fit a speedlight. Pictured here is my SB900. 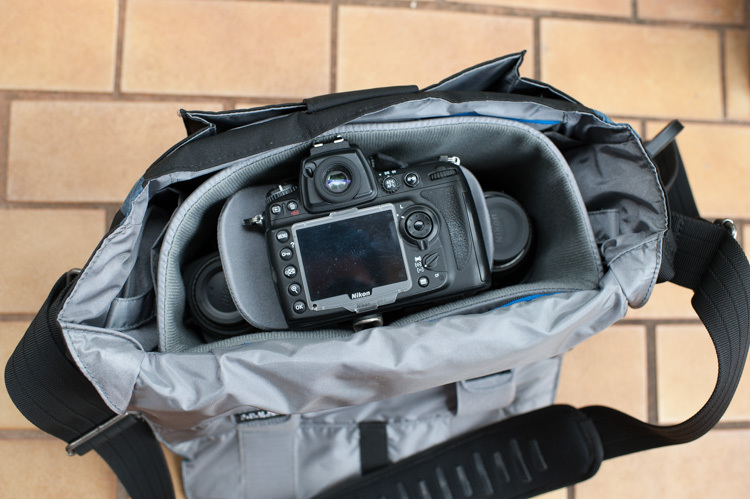 However, when loading the whole insert with camera gear, it becomes a tight fit if both of these pockets are occupied as well. One of my favorite carry-over features from the Retrospective series is the Sound Silencers. The concept behind this is that you can engage the velcro on the main flap, so that it doesn't attach to the bag when the flap is down. This prevents the loud velcro noise when you are indoors, perhaps a museum. The photo above shows the velcro open, and the photo below shows it engaged. 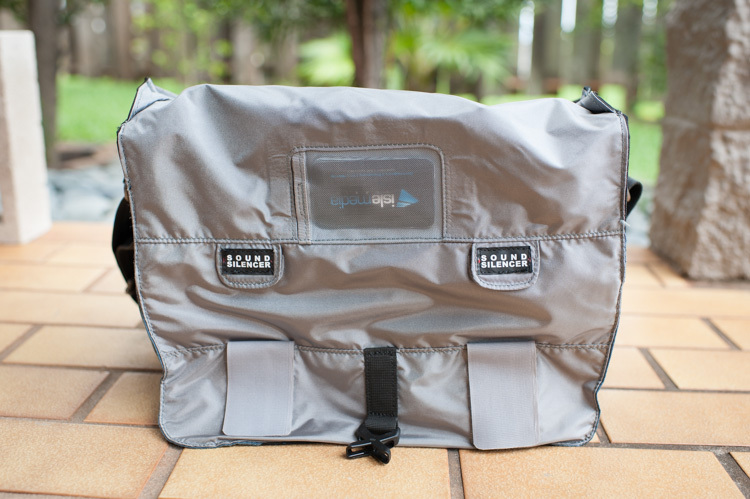 I love it that Think Tank's bags all come with seam-sealed rain covers, since I somehow find myself shooting in the rain a lot. This rain cover does the job, and has kept my gear dry, from light showers here in Hawaii, to downpours in Bangkok. 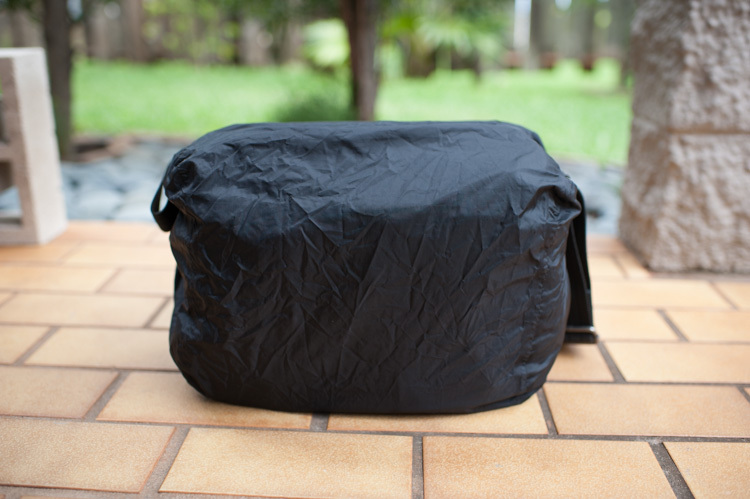 I will say, however, that this rain cover can be a bit of a pain to deploy quickly, since it wraps under and over the camera bag. The bag has these clips that hold the rain cover in place, but it becomes a pain if you need to access your gear while the rain cover is on. I LOVE this shoulder strap. 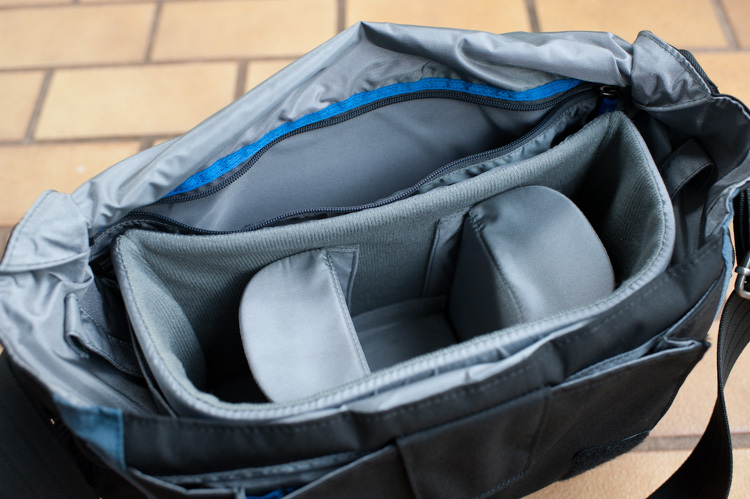 I've used a few shoulder/sling bags in the past, and Think Tank got it right this time. 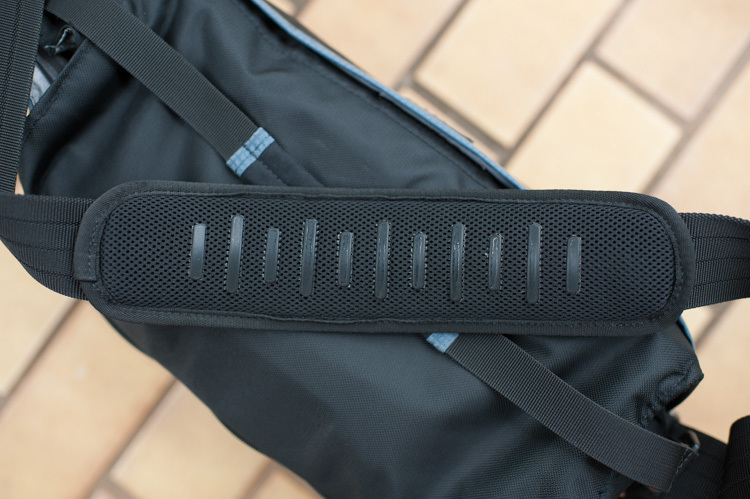 Th strap is nicely padded and has these rubber strips sewn into the padding, which prevents the strap from sliding off your shoulder. The pad also slides up and down the strap, so you can adjust it one your body when you are walking. However, I do wish that the shoulder strap itself was on a pivot clip system, because it tends to twist up and get tangled when I pick it up sometimes. One thing I didn't like about the Retrospective series was that the outer pockets were wayyy to small to fit a water bottle. 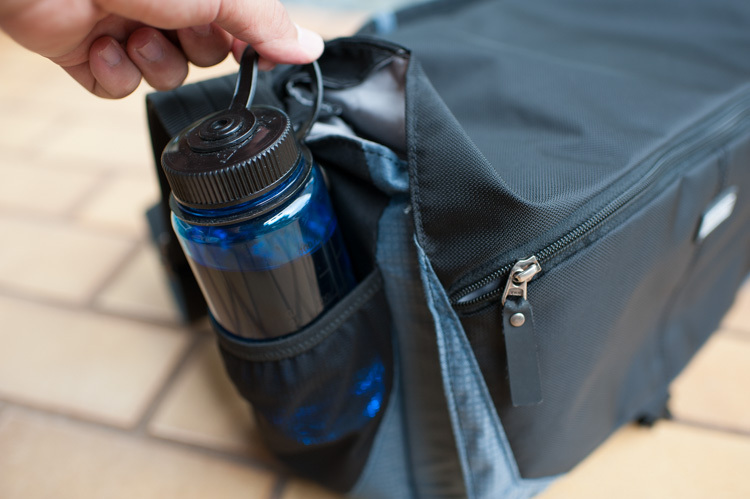 The City Walker has a mesh pocket on each side of the bag, which normally houses my water bottle and rain cover. It can also fit two flashes (SB900) if I need the room. A no-frills carrying handle, but it does the job...would've liked it to be a bit shorter. I kept the velcro setup that the bag came with and just tweaked them a little to fit my glass better. The above setup is if I am traveling very light, and only need a couple lenses and a body. The Nikon 24-70mm 2.8 (lens hood reversed), Nikon 45mm 2.8 PC-E (no lens hood), and Nikon D700 are shown here. 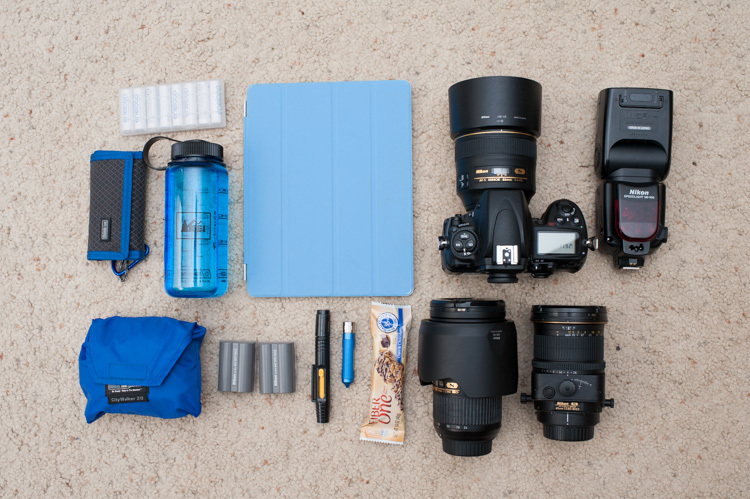 This setup allows me to change lenses without having to put the bag down, which I appreciate when I was traveling. This second configuration is if I need to carry a little more gear with me. The Nikon 24-70, Nikon 45mm PC-E, and Nikon D700 with Nikon 85mm 1.4 attached is shown here. 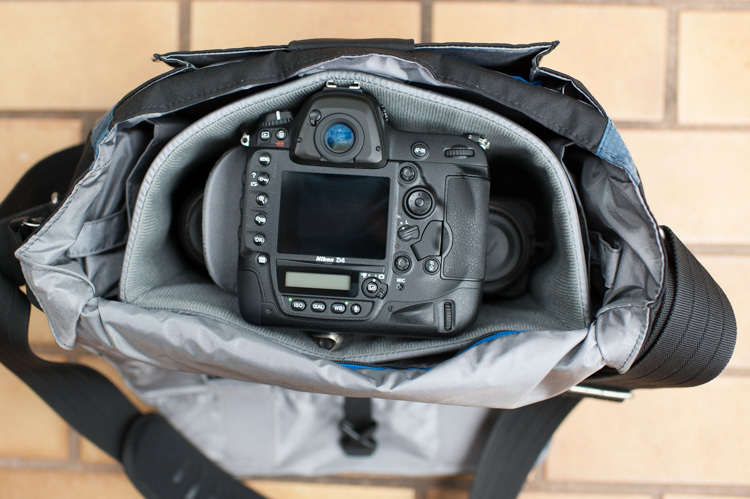 My main camera, the Nikon D4, can also fit in this bag, although you can only store it face-down. Here is what the bag can hold, fully loaded (although I rarely carry this much stuff). *Note: Sometimes I've substituted the 24-70 for another D700, or my 50mm 1.8G and 28mm 1.8G. --Roomy interior, with removable insert. 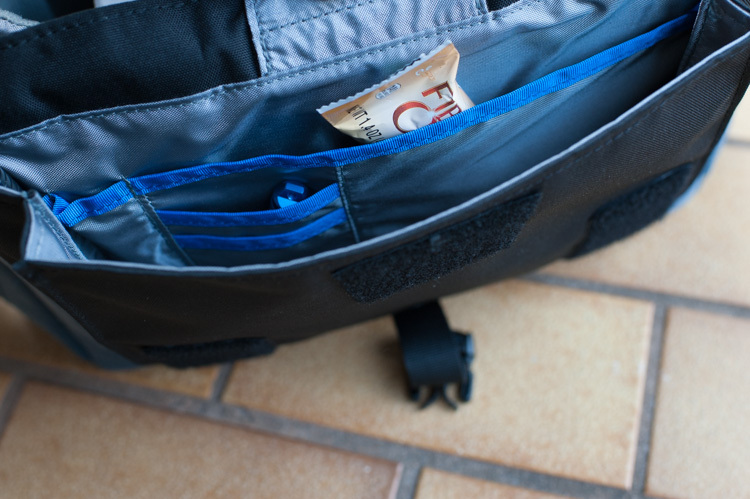 --Lots of zippered pockets for storing stuff. 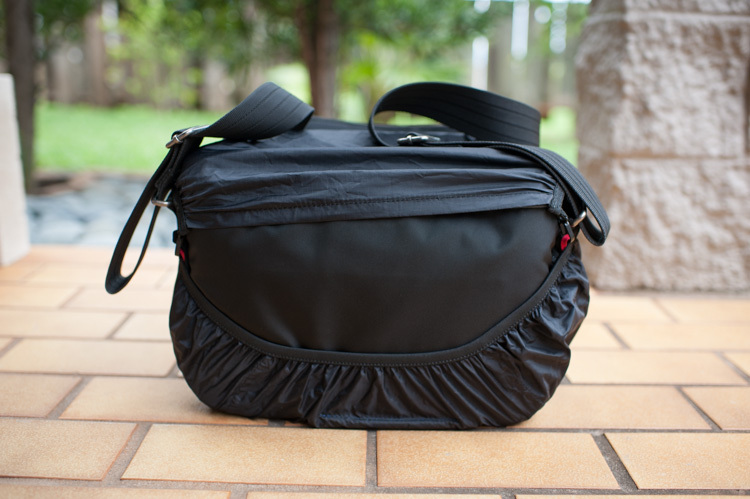 --Modest appearance doesn't scream camera bag. --buckle-style shoulder strap tends to get twisted sometimes when I pick the bag up. 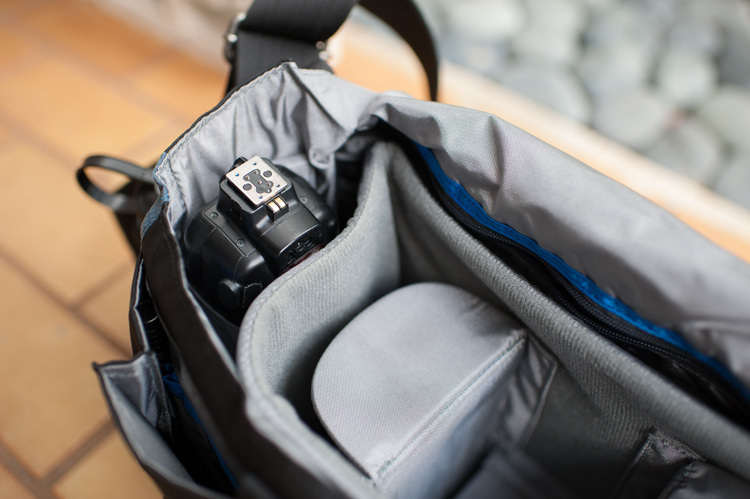 Overall, this bag does exactly what I need it to do: protect and carry a light setup, ideal for small shoots and traveling. Thanks for reading, and feel free to comment if you have any questions or feedback! Nice write up Reese. Do you think the large size bag might fit a pro body better? 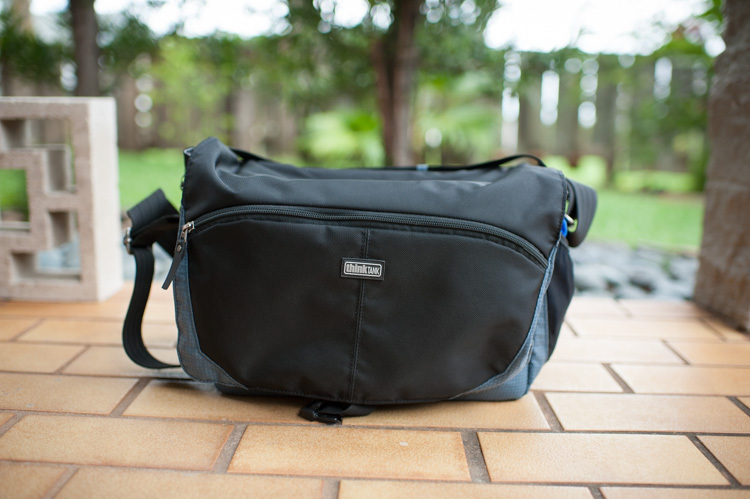 I've been searching for that holy grail of messenger bags that will fit my D3, two to three lenses, and still not look like I'm carrying luggage on my shoulder. Ona bags fit this mood but at over $250, they are pretty pricey.